THREE new solid silver trophies that will be presented at this year’s Henley Royal Regatta have been unveiled. The Town Challenge Cup, the Hambleden Pairs Challenge Cup and the Stonor Challenge Trophy will be awarded to the winners of women’s events that were introduced last year. The move meant there are now six open events for both sexes for the first time. All three trophies were made by Ottewill Silversmiths in Kent, which has previously restored several regatta trophies and built a new base for the Grand Challenge Cup in 2014. Regatta chairman Sir Steve Redgrave, who unveiled the trophies on Monday, said the total cost was “not cheap”. He told how the regatta committee had considered waiting several years before commissioning trophies in order to gauge the popularity of the events. However, members decided to speed up the process following spectators’ reaction to the lack of trophies at last year’s prize-giving. Sir Steve said: “We usually wait a while and take a ‘softly, softly’ approach just to make sure we’re doing the right thing but in this case it was so obviously the right move. “The new events give us an equal number of events for men and women and while the Olympics are rightly making moves towards gender parity, we wanted to get there beforehand. “In that sense, it was an easy decision for the committee. The committee began discussions with Steve Ottewill, who runs the silversmiths, in October and the work started in January following consultation with stewards. Sir Steve said: “We were concerned that we’d left it a bit late but the team gave us every confidence that they could deliver on time. They said it was their most enjoyable project because of its scale and the prestige of contributing towards such a high-profile event. The Town Challenge Cup for open women’s coxless fours is named after the trophy that was presented to the winner of the coxed fours event at the first regatta in 1839. That was one of only two presented that year and was awarded annually until 1883, when it was given in trust to the Henley Town and Visitors’ Regatta. The new cup has four handles, each representing a crew member, which radiate from two intertwined silver spirals that are wound around the stem. The regatta committee had considered having three handles until realising the Remenham Challenge Cup already has that number. The Hambleden Pairs Challenge Cup, which is open to women’s coxless pairs, commemorates the trophy presented for the pairs event by Viscount Hambleden at the Royal Henley Peace Regatta in 1919, the first after the end of the First World War. In 1924, he allowed a portion of his land on the Berkshire bank by the start line to be trimmed to create the regatta’s 2,112m “straight” course. The original cup was won by Australians and taken back to their country but will return for the Peace Regatta’s centenary next year. The new trophy resembles a whirlpool and its name is engraved in irregularly-shaped lettering in the space between the top two ripples. 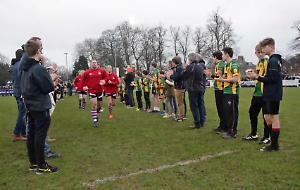 Instead of receiving medals, the winners will be given two smaller trophies in a similar design to keep, in a similar manner to the silver goblets which accompany the Nickalls’ Challenge Cup. The Stonor Challenge Trophy for the open women’s double sculls commemorates Thomas Stonor, later Lord Camoys, who chaired the meeting at which the regatta was founded and went on to become one of its first stewards. It depicts a more gentle swirl, similar to that left in the wake of a rowing blade, in the shape of a plate with a gold plated circle at the centre bearing the faces of Tamesis and Isis, the male and female embodiments of the River Thames. Sir Steve said the trophies would be presented at this year’s regatta by “someone the rowing world knows very well”. He hoped that Grace Prendergast and Kerri Gowler, the New Zealand pair who won the Hambleden Cup last year, would return to collect their miniatures.